You guys, I am just in love with strawberry season. 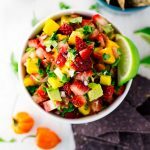 In case you couldn’t tell from all my strawberry–themed posts, this strawberry mango salsa is reaching right into my strawberry-loving brain and hitting the YUM button repeatedly. That’s a thing, right? I mean, you guys all have a certain dish that just hits the sweet spot every.single.time you have it? 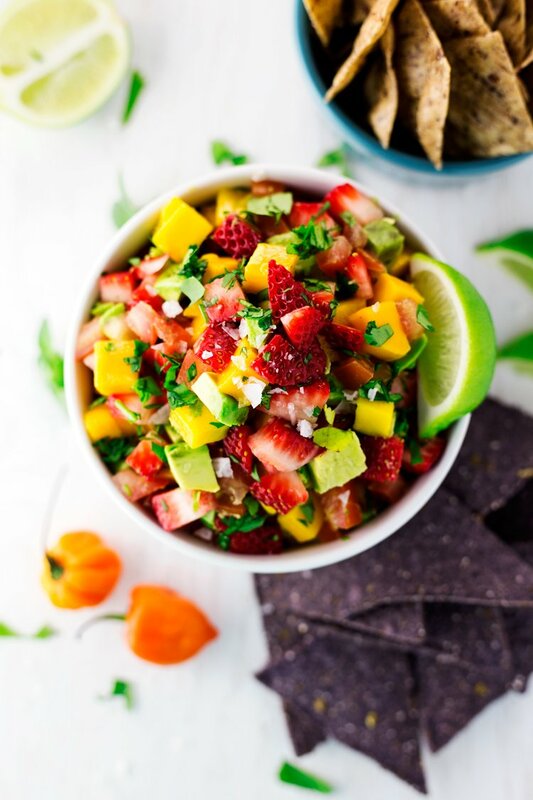 What I really love about this strawberry mango salsa is that you’ve got sweet and savory together, as well as that amazing kick of heat from habañero peppers. Strawberries and habañero peppers go hand-in-hand, just like mangoes, so I couldn’t possibly use anything else. I will always always always recommend starting with just a few diced slivers of the habañero, because it packs so much heat, it can easily overwhelm those who have a lower tolerance to the heat (like me, I am such a wimp, yo). So, start with less and work your way up, because the first batch almost killed my husband, and he is all about that bass. I mean, heat. 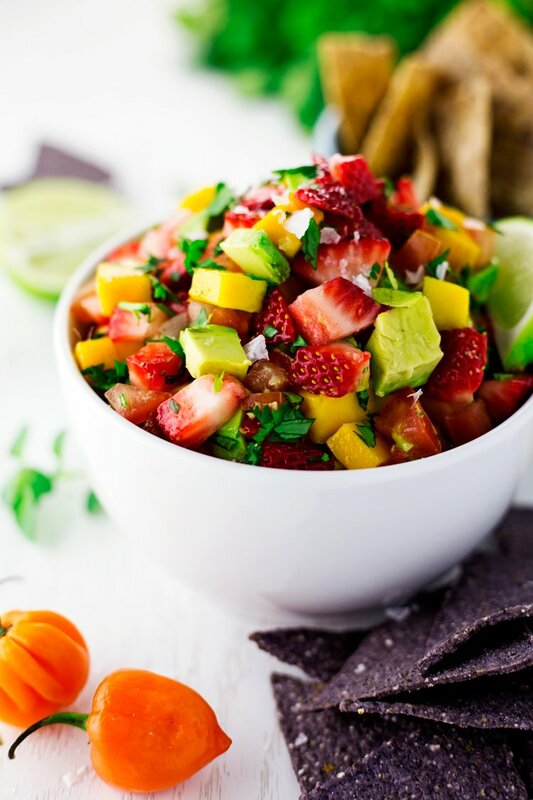 Just toss all those deliciously diced bits of Heaven in a bowl with a little salt, pepper, garlic, and lime juice and get ready to empty that bag of tortilla chips, because you are not gonna want to stop noshing on this superb snack! Aaaaaaaaaand, if you love strawberries as much as I do, you are in luck! I’m hanging with the Feast & Devour food blogger club, and we have churned out a whole bunch of amazing recipes just for you! Every month we’ll be sharing recipes centered around a specific food or theme (next month the theme is grilling!) on the 20th, so you’ll have so many recipes to look forward to, it will make your brain explode. 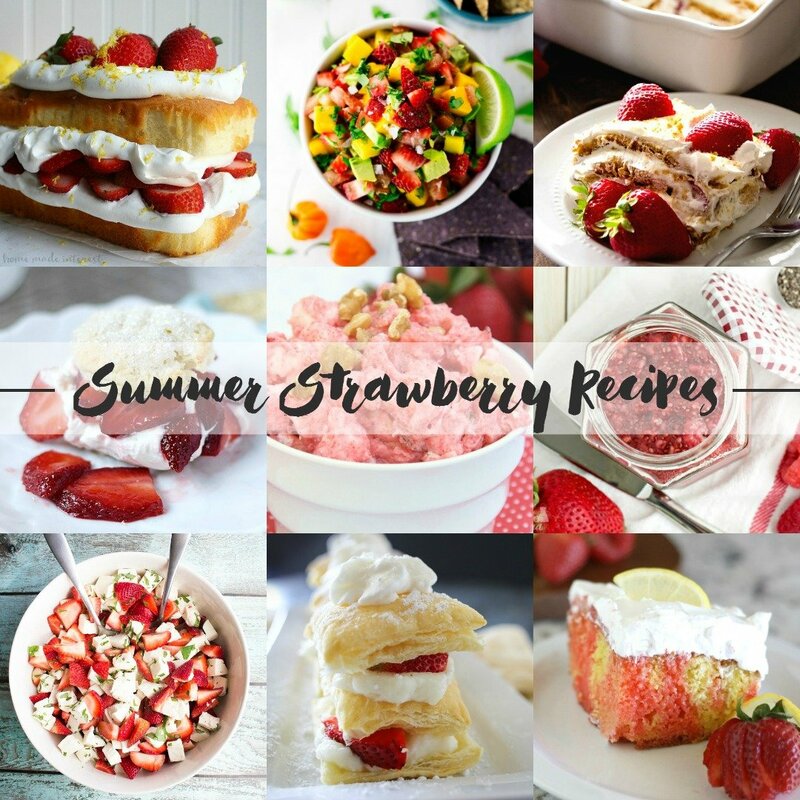 So come, check out these strawberry-centric recipes and get ready to drool! 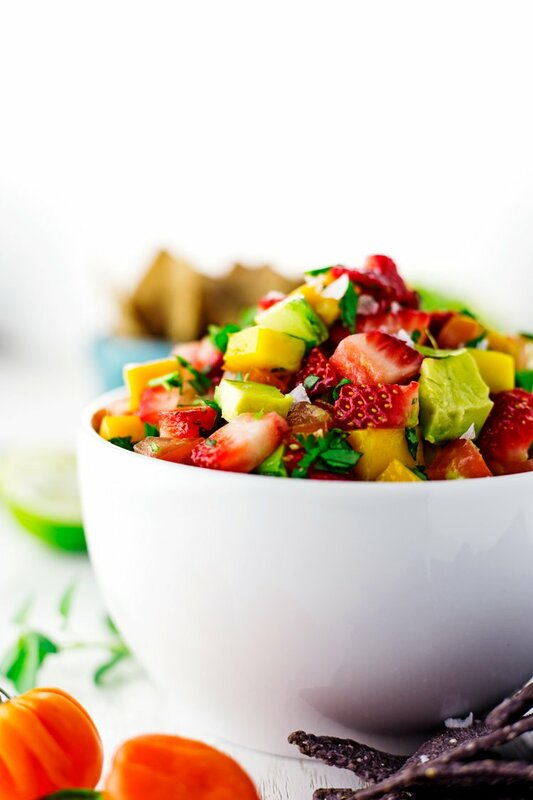 || Strawberry Napoleons from Kleinworth & Co.
Add the strawberries, mango, avocado, 1/4 of the habañero, and cilantro to a large bowl. Sprinkle with the garlic powder, salt, pepper, and lime juice and stir gently to combine. Adjust heat by adding more habañero if needed. Serve with tortilla chips and enjoy! These are all my favorite flavors, count me in! Can't wait to make this soon, just pinned! Oh my goodness...This salsa look absolutely delicious!! Bookmarking to try soon. Beautiful photos. I love the idea of the lime juice! A lot of strawberry salsa recipes requires tequila... Your recipes always look so great. 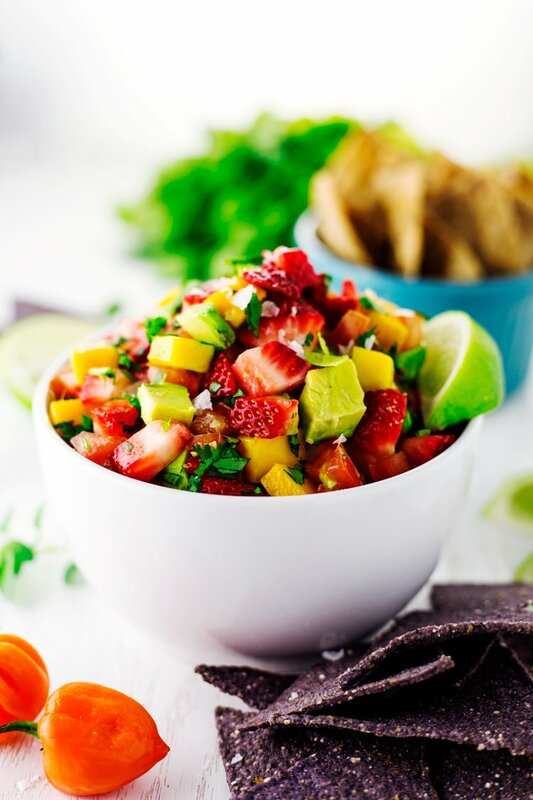 I have had mango salsa, but I never would have thought to make strawberry salsa. This looks very tasty. 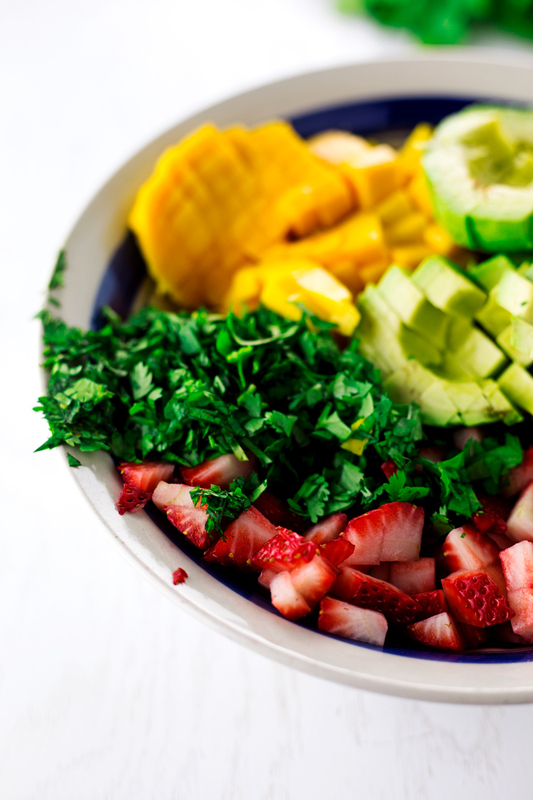 I am loving the vibrant colours, just screaming "Summer" in a bowl.